HURFOM: A human rights coordination meeting organized by Equality Myanmar (EQMM) and Local Resource Centre (LRC) providing local community-based organizations (CBOs) and human rights defenders an opportunity to meet with the Myanmar National Human Rights Commission (MNHRC) was held at the Rehmonnya Hotel in Mawlamyine, Mon State, on February 5th 2019. The MNHRC shared information about the commission’s structure and activities, and discussed the commission’s limitations with respect to human rights advocacy with those in attendance. The Assistant Director of the MNHRC, U Za Lwin Htoo, told those present that the MNHRC was a Union government organization created by the state, and funded by the state, but that it was an independent body. “There are some issues that the commission can’t address. 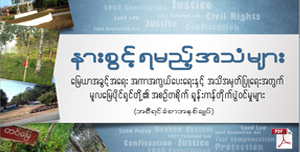 The commission can’t use its power to instruct the judiciary or intervene in court proceedings…The commission can’t make a final decision in a human rights case like the court does…But the commission is fully authorized to advise the Union government on how to address human rights issues,” said U Zaw Lwin Htoo. He also informed those in attendance that as part of its activities, the commission educates government staff, military personnel, the police, and prison staff on the importance of human rights, and holds consultation meetings with community groups to promote human rights. 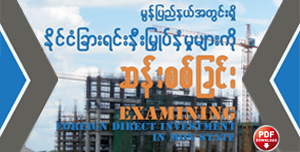 Apart from the MNHRC, other government bodies and staff in attendance included the Mon State Legal Aid Team, the Mon State Rule of Law and Justice Coordinating Group, Dr. Aung Nyne Oo, the Deputy Speaker of the Mon State Parliament, U Aung Kyaw Thu, the Chairperson of the Mon State Complaint and Appeal Letter Review and Assessment Committee, and Daw Khine Khine Lei, the Chairperson of the Mon State Parliament Women and Child Rights Committee. As the meeting progressed, human rights defenders and representatives of the CBOs in attendance engaged the MNHRC in discussion, sharing information about their respective organization’s activities, and their experiences working to address issues of human rights and the rule of law in Mon State. 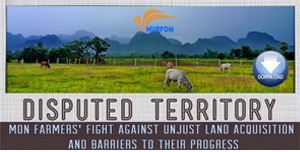 Some in attendance expressed their dissatisfaction with what they believed to be the MNHRC’s lack of genuine concern about the human rights situation in Mon State. 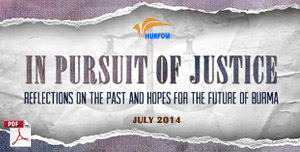 “When we collect evidence of human rights abuses and violations, to whom do we report and how? The MNHRC must become informed about the human rights situation in Mon State…This is the purpose of this meeting,” said Min Win Bo, the Coordinator of LRC’s Mawlamyine office. Following Min Win Bo’s lead, a local human rights activist from Ye Town asked why the commission had not replied to reports about human rights violations in Mon State. Specifically, the activist mentioned a dispute over land ownership that had gone unaddressed by the commission, wherein a judge had ruled in favor of someone holding a forged land use certificate. Taking their cue from the activist, members of the Mon State parliament who were in attendance also voiced their frustrations to the commission about corruption in Mon State’s judiciary, and the MNHRC’s inaction to remedy such concerns. 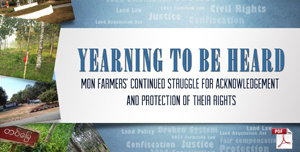 Criticism of the MNHRC by civil society groups has been longstanding. 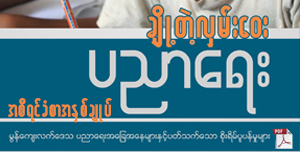 Prior to its accreditation by the International Coordinating Committee Sub-Committee on Accreditation in 2015, HURFOM along with 148 partner organizations called for the commission’s accreditation to be postponed given that the MNHRC was not supported by the people of Burma, and failed to fully comply with the Paris Principles, a set of standards by which all internationally accredited National Human Rights Institutions are required to operate. 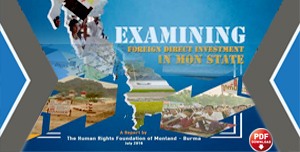 In 2018, scrutiny of the MNHRC was renewed when a joint report released by civil society groups evinced the inability of the commission to address rights violations committed by the military, the commission’s continued failure to comply with international standards, and the commission’s overall lack of transparency and independence from government. According to the MNHRC, 3,281 reports were submitted to the commission in 2018, of which they investigated 668 as the majority of reports submitted were deemed to be beyond their capabilities or without the information needed for the commission to proceed with an investigation. Of the 668 reports investigated, 516 received some manner of response from various, undisclosed government departments, while the remaining 152 received no response despite being investigated. The commission also added that it had undertaken 14 field investigation in addition to these 668 investigations. 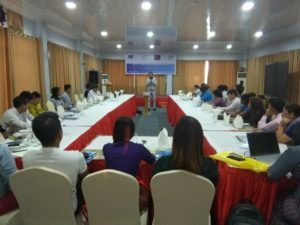 In all, 36 people from the MNHRC, the Mon State Parliament, legal aid groups, and community-based organizations along with independent human rights defenders convened for the coordination meeting.